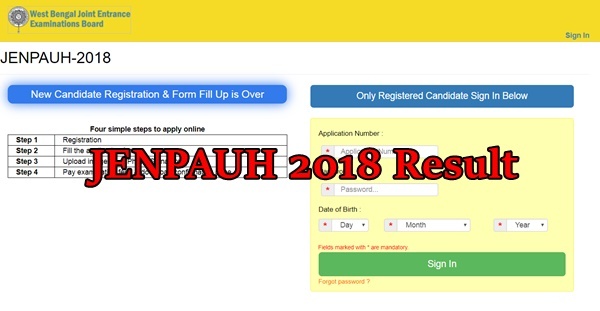 WBJEE JENPAUH Result 2018: West Bengal Joint Entrance Examination Board (WBJEEB) has released the JENPAUH 2018 Results and Rank card on its official website, wbjeeb.in. The JENPAUH examination has been conducted by WBJEEB on 27th May for aspirants seeking admission into BPT, B.Sc Nursing, and BASLP courses. This year a huge number of candidates have applied for the JENPAUH examination. The candidates attempted the examination are eagerly waiting for the JENPARH results 2018. The WBJEEB has mentioned the exact time of the result release i.e on june 23rd. But the WBJEEB released the JENPARH result today at 6 pm. Candidates can check more details of West Bengal JENPARH 2018 result from the below article. The West Bengal Joint Entrance Examinations Board (WBJEEB) annually conducts the JENPARH examination to offer admission into various Graduate Degree courses such as B.Sc Nursing, B.H.M.S., B.A.M.S., B.U.M.S. and B.P.T. ; Central Selection Committee (Nursing) courses and other medical courses. WBJEEB Affiliated colleges are going to offer these courses for aspirants. Candidates seeking admissions in these courses have appeared for the JENPAUH examination on 27th May 2018 and waiting to check their results. The WBJEEB is going to announce the JENPAUH results 2018 on its official website, jenpauh-2018.wbjeeb.in. Candidates can visit the page to check their result. 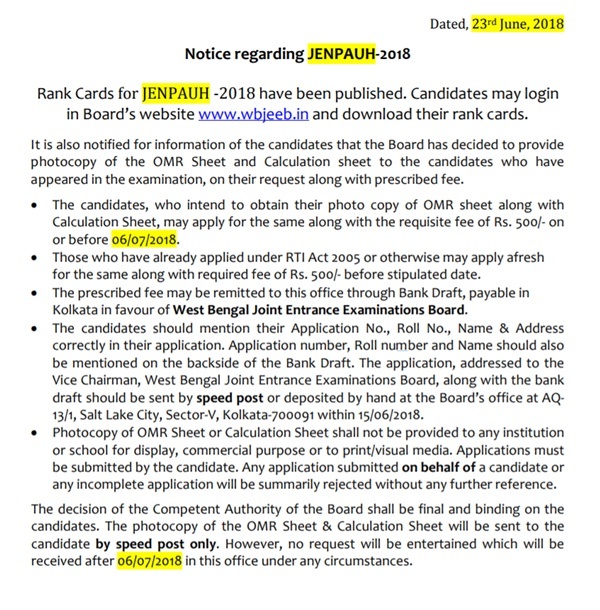 WBJEE JENPAUH / JENPARH 2018 Answer Key Release Date Released . Students qualified the test with good rank will be given admission in courses selected by them. The admission will be done on the basis of merit scored by the aspirants. Students can keep checking the WBJEEB website on the frequent basis to know more information regarding the document verification and counselling dates and other information. Sir when jenpahu councling start???? sir i get 2957 rank in nursing rank is there any chances to get a private college in bsc nursing ??? Sir,my nursing rank in jenpauh is 1009, have any chance to get admission in private/Govt.nursing college ?. Can I get chance in govt college?? Sir,my sc rank is 1159…can I get chance any private college for bsc nursing??? Please sir reply me. Sir my common rank is 3515. OBC b rank is 467. Am I eligible for BASLP, BPT, BMLT course in any govt college? Sir my nursing rank is 3247…can i get a chance in any private college?. Sir , my merit rank is 800 and nursing rank is 520. Will I get any chance in govt college for b.sc nursing? Sir my nursing rank is 3247.Can I get any chance in a private college? Sir my sc rank is 1523 and general rank 10371 in bsc nursing.can I get any chance in govt or private nursing collage? Sir my SC Nursing rank is 1335.can I get any chance in govt college?